Railpictures.ca - Marcus W Stevens Photo: The price of progress. 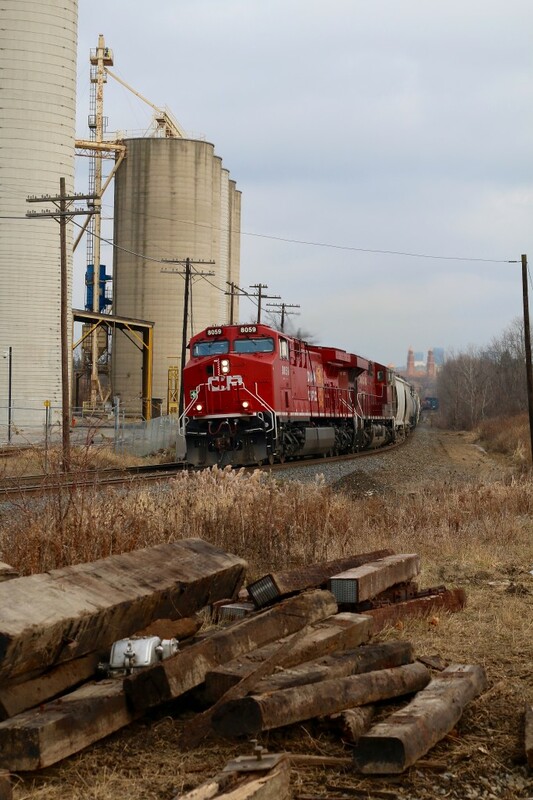 With all the recent upgrades to the Galt subdivision, including the future activation of the new signals through Streetsville, it appears that the old ADM Mill will not see any service, anytime soon. Several weeks ago the connecting track along with the two switches were removed, the ties are still in the ground for now. The spur still remains intact beyond the curve in the background. Its hard to believe that about a decade ago ADM received daily service, often twice on Wednesdays. Today local T14 only switches Streetsville on Monday, Wednesday and Friday’s, and the Ardent Mill off to the left is usually only served once a week or as needed. There are no cars at the mill today. A far cry from years gone by when both Reid’s Mill and ADM were the main customers in town. Here we see rebuilt 8059 heading Hamilton bound as it passes the discarded remains of a portion of the old ADM spur. | Railpictures.ca – Canadian Railway Photography – photographie ferroviaire Canadienne. Caption: The price of progress. With all the recent upgrades to the Galt subdivision, including the future activation of the new signals through Streetsville, it appears that the old ADM Mill will not see any service, anytime soon. Several weeks ago the connecting track along with the two switches were removed, the ties are still in the ground for now. The spur still remains intact beyond the curve in the background. Its hard to believe that about a decade ago ADM received daily service, often twice on Wednesdays. Today local T14 only switches Streetsville on Monday, Wednesday and Friday's, and the Ardent Mill off to the left is usually only served once a week or as needed. There are no cars at the mill today. A far cry from years gone by when both Reid's Mill and ADM were the main customers in town. Here we see rebuilt 8059 heading Hamilton bound as it passes the discarded remains of a portion of the old ADM spur. The residents have wanted ADM/now Cargill gone for Years. It’s a start that they don’t have a train rumbling through their back yards. I, and I vouch for most up here, would have loved it! RIP. Reid’s became Kraft, then Ardent took over for them when Mississauga wouldn’t allow them to expand. The ex Kraft mill on the left wasn’t serviced until recently (maybe a couple of Years) and the spur to the right to Cargill hasn’t been for awhile I understand. Is Reid’s Mill at the foot of Barbertown Rd? Never heard of it referred to that. Sad.. yet more industry reverting to trucks and clogging our roads. Yes lots of fond memories on that spur. At least I got a few photos over the years. Ouch! This one really hurts!